Albion captain Bruno says it would be very special to reach the Premier League after signing a new contract with the club. The 36-year-old joined the Seagulls from Valencia in 2012 and has penned a new deal until June, 2018. He has scored six goals in 185 appearances for the club, having previously played for Espanyol, Lleida and Almeria in Spain. Speaking to www.seagulls.co.uk about the race for the Premier League, he said: “I always try to be focused on my job and do it in the best way possible. The main thing is to get to the Premier League, which is what everyone at the club deserves. “It would be my top achievement. I’m really happy with my career because I’ve achieved great things, playing in the Champions League and La Liga. On signing the new contract, Bruno said: “It feels really good. 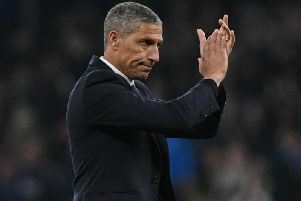 I’m really happy because the club thinks I deserve a new deal, and I’m really happy for my family as well, because they’re settled in Brighton and Hove. “There are a lot of things that make living here very special. Since the first day we’ve really enjoyed the city and it’s atmosphere.